+Bruce Heard, formerly of TSR and of Mystara and "Voyage of the Princess Ark" fame, has been working on his new world Calidar for a little bit now. I reviewed the premier product, Calidar in Stranger Skies, a while back and I really loved it. I have used bits and pieces of this world in my own games now for a couple of years; building up to something a little bigger. The great thing about Calidar, and what Bruce is doing with it, is it can be added to any game world or campaign with only a little bit of fuss. OR you can go whole hog with it and have it as your game world. The newest book out, Calidar, Beyond the Skies, really helps with either plan. Ethics in Game Reviewing: I received a copy of hard bound book in exchange for a fair review. All links are affiliate sponsored links. Further disclosure: I was planning on reviewing this anyway, I just moved it up a little bit. 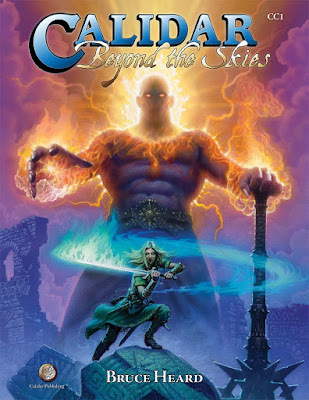 Calidar, Beyond the Skies is part campaign book, part cultural reference and part guide to gods. There is only minimal stats in this book. This is both an advantage and a disadvantage. The obvious disadvantage is of course judging the power levels of the various gods. I am going to say right now that this REALLY is not a disadvantage. Gods are not Monsters. Even in Calidar where the Gods often interfere in the affairs of mortals, those mortals are not going to pick a fight with them. Relative powers are given and that really is enough. The advantage is a true advantage. Playing old school D&D? Great! Playing Pathfinder? Great! D&D5? Equally great! But I am getting WAY ahead of myself. I am reviewing the hard cover version of the book. It is 248 full color pages on decent weight paper and full color covers. I put the production values at the same level of the best of WotC's D&D or Paizo's Pathfinder. The book begins with discussing the common abilities given to all divine beings and a discussion on what they are and do. This follows a brief overview of the "planes". This is a section worthy of the best of the TSR-era Manual of the Planes and right next to the 3rd Ed Manual of Planes. I have to admit I love seeing the "energy" planes configured like a d10. Totally using that one. Since this is system free there is section on how to convert your system to something the book uses. The easiest of course is a percentage system. Depending on your game's chosen system there is a conversion here. All of that and we are now into the "meat" of the book. The map of the Great Caldera is given again with the countries and cultures highlighted. This is important and a page I found myself coming back to as I read each section. There is a great table on pages 14-15 that has every god, their cultures and their area of interest. I was happy to see some overlap and missing areas. Gods are not supposed to be neat and tidy things. Some interests are over-represented, some have none at all and some gods stretch across more than one culture. 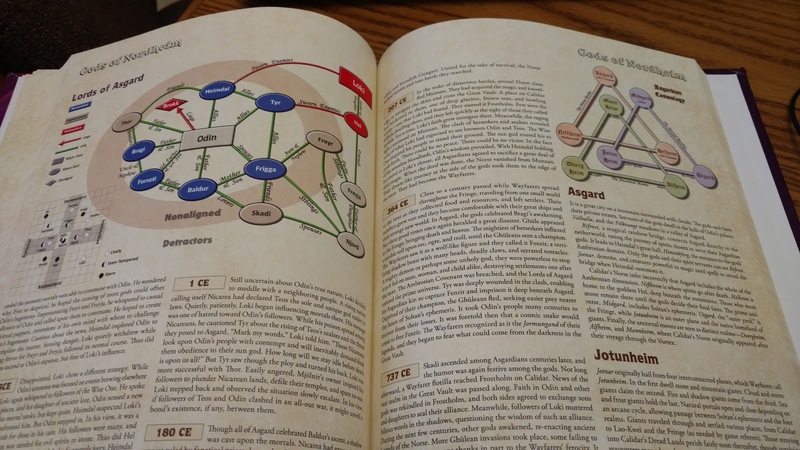 Ok at this point if you have ever read any "Gods" or "Pantheon" D&D book you can easily start making sense of things. After this we cover the different pantheons and cultures. We cover 10 such groupings of gods along with chapters on Rewards, the World Soul of Calidar and various godly trappings. This is a book that takes full advantage of color. Greater gods are in bold, evil gods are listed (title only not text) in red and benevolent gods are likewise in blue. So a greater evil god is in bold Red. When each grouping of gods is introduced we get the names and interests (spheres) of all that pantheon. Common attributes for all the gods are given (what they have in common) and an overview of their Genesis story with a timeline. We then get into some really interesting material. A kind of flow chart is given on the relationships between the gods of the grouping. This is best seen in the Gods of Nordheim, which are "imported" from Norse myths by travelers long ago. After this each god is listed with a stat block of interests, allies, cults, foes, centers of faith and holy days. Lots of details really. There is so much in this book that I think it is going to take some more readings to digest it all. Each section also contains neat little bits like various temples, the gods' personal symbols, other bits to round out the faiths and make them feel like they real. In some, like for example the Gods of Meryath, weather (and in particular rain) are so important that the seasons are also discussed in relationship to the gods. The last sections also detail various Elemental Lords, demons and mythological beasts and other near-divine beings. There is a lot going on in this book. If you are a fan at all of gods, myths and using them in your games then is a great addition. Even if you don't play in the Calidar world this is a well thought out collection of myths. 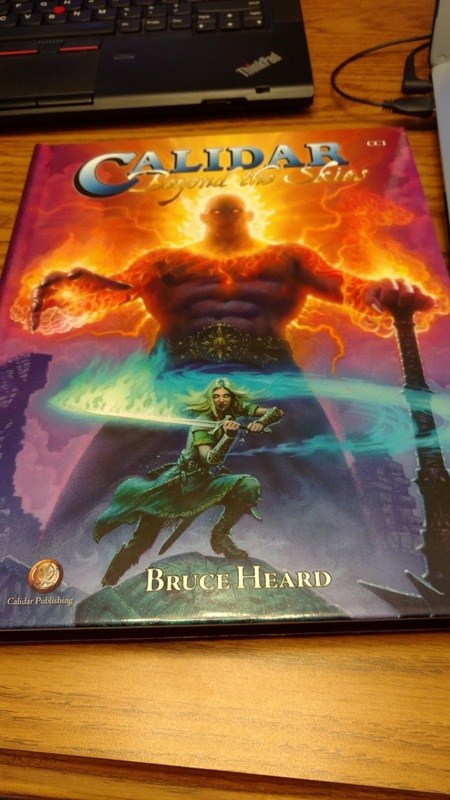 I found this just as enjoyable as reading D&D's "Gods, Demigods and Heroes" the first time. If you need some good, new-to-you-and-your-players gods then this is a must buy. The art throughout is fantastic (that's Soltan of the Narwan on the cover) and really sets this book above others of it's kind.